Ashley Barnes hopes his goal and man of the match performance against Swansea City earns him a start against Arsenal. But he is well aware that no player can take a starting berth for granted in this Burnley side – especially up front. Barnes came in for Chris Wood to face the Swans, with the New Zealand captain not considered after his World Cup play-off travel exertions. Many had expected Sam Vokes to start after his winning goal at Southampton going into the international break. And Nahki Wells is also up to full fitness and champing at the bit after his £5m deadline day move. Barnes knows he has to take the most of his opportunoties, and he said: “There’s no such thing as having a concrete place. “Someone else could play ahead of me on Sunday, either Vokesy or Woody. “Woody was out of the squad due to travelling reasons, so he’s got to come back in, and we’ve got Nakhi and Jonny (Walters) as well. “We’ve got really good competition for places. “It was nice to get the nod, it was a nice surprise. Such competition for places is replicated across the squad, and Barnes feels it brings the best out of everyone: “That’s it, we need to to be pushing each other on. “I think so, the competition for places, not just us as strikers but throughout the team, you can see it. Competition is improved, and so is Burnley’s game management so far this season. They are finding more ways to win, and controlling games more to Sean Dyche’s lking. Barnes admitted: “We’re growing as a squad, every time we stay up, and every game we’re growing as individuals as well. “We know how to see out games and the circumstances of a game and when it’s going a bit dead. 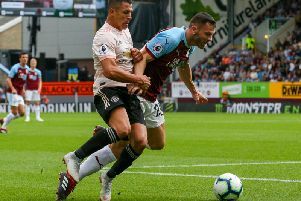 He has scored some key goals in Dyche’s reign, but he enjoyed his thumping strike against the Swans: “t’s been a long time coming, but I believe in myself and what I can bring to the club and the team.